Hands 2 Grow is happy to offer its expertise to schools, libraries, camps, churches or other groups who are interested in learning more about puppetry or perhaps even starting their own team! Hands 2 Grow offers a variety of workshops to meet the needs of your group or organization. "Enhance Your Class with Puppets"
"I Only Have Two Hands! (or Puppets for Small/Beginning Groups)"
"I Have Puppets -- Now What Do I Do?" "Puppetry & Literature" Using Books and Puppets Together"
"Interactive Reading: Actions Speak Louder Than Words"
"Make-n-Take with Hands 2 Grow"
"DISCOVER PUPPETRY" TRAINING SESSIONS are designed to train individuals or teams basic puppetry skills. Topics covered include basic puppetry techniques, puppet building, stagecraft, and so on. Arrangements can be made for single or multi-session presentations. Sessions will be tailored to group needs. Workshops are best suited to groups between 10-20 participants so that everyone can receive attention and hands-on training. Cost is normally charged per person. Call to arrange particulars for such events. Click here to check out the Discover Puppetry Resource booklet - now available for purchase. 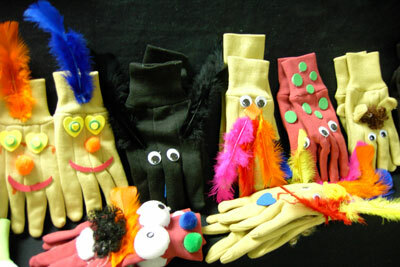 Hands 2 Grow also offers puppet building workshops for groups. Call to find out more about these opportunities to build your team's stock of puppets! Our puppet building workshops can be tailored for all ages or be part of a VBS or library activity! The colorful puppets below are from an elementary school workshop.